We’ve got a healthy, vegan version of the classic Caesar salad that’s perfect for lunch or a light dinner. 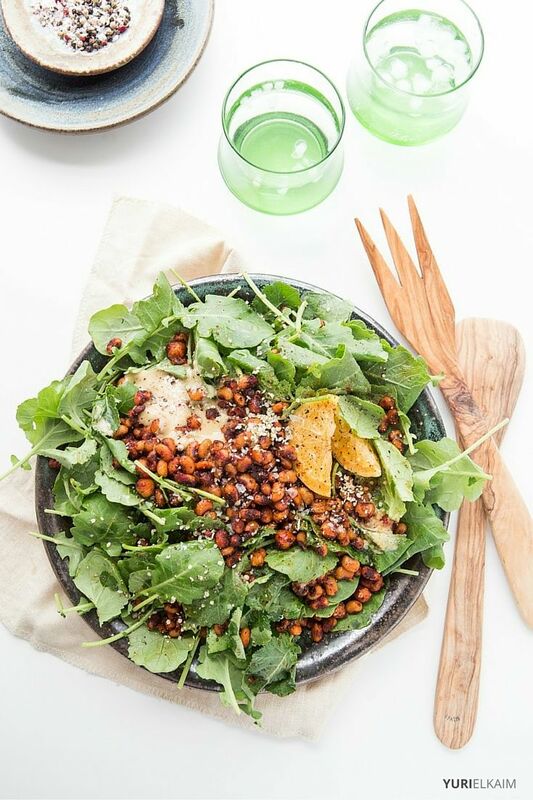 You can top this flavorful, light-yet-filling salad with roasted chickpeas, black-eyed peas, or lentils. Or you can mix it up and enjoy two (or all three) at once. 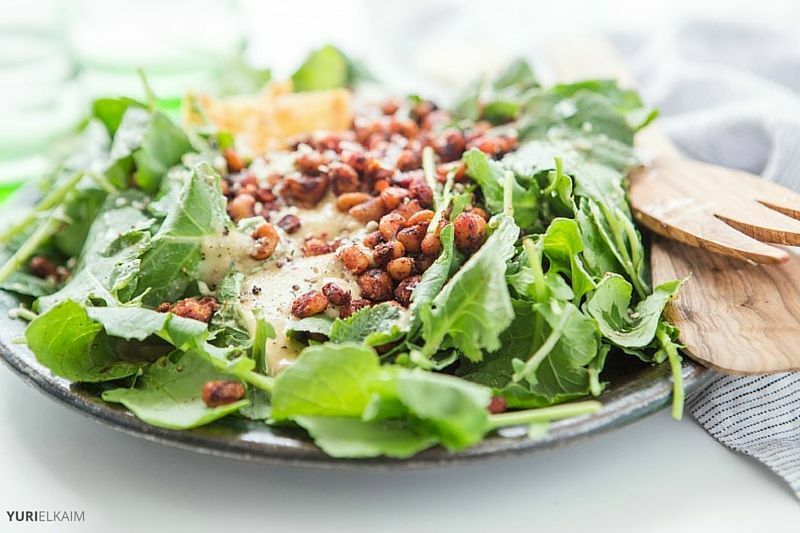 Any which way you choose, this vegan Caesar salad is a quick, healthy eating recipe that will earn a place on your lunch go-to list. If you’re a fan of Caesar salad, you’ll love this vegan version that’s got major health benefits. Crunchy kale holds up well under the deliciously creamy garlic lemon dressing. Your choice of either cashew butter or tahini gives this dressing incredible texture, and when combined with the Bragg’s aminos, takes on a pleasant umami taste so you won’t miss the anchovies. The chickpeas are skillet-toasted in a paprika honey rub that gives them an irresistibly smoky, sweet taste. Kale is a rock-star veggie. It’s low-cal yet packs in an incredible amount of vitamins, minerals, and antioxidants – in fact, kale has been called the most nutrient-dense food on the planet. It’s in the cruciferous vegetable family along with broccoli, cauliflower, and cabbage, so it’s got good standing for lowering cancer and cardiovascular risk. Kale has high amounts of powerful antioxidants like quercetin and kaempferol that counteract oxidative damage. It’s also high in vitamin C, which aids in collagen synthesis and boosts the immune system, and vitamins A and K for eye and bone health. Kale is also a good source of calcium, so it’s a great way for vegans to sneak this essential mineral into their diet. Compounds in kale like sulphoraphane and glucosinates help to fight the formation of cancer cells, and studies on kale have shown it’s effectiveness in helping to prevent bladder, breast, colon, ovary, and prostate cancer (1, 2, 3, 4). As if that’s not enough, kale is also high in fiber, so it keeps you satiated after eating, and has anti-inflammatory properties from omega-3 fatty acids. I’ve added chickpeas for concentrated plant-based protein. One cup of chickpeas contains a whopping 15 grams of protein. Why is this important? Protein breaks down into amino acids in your body, and those amino acids aid in maintaining and repairing tissue as well as transporting and storing important nutrients. Adequate protein intake is essential for keeping the body functioning optimally. 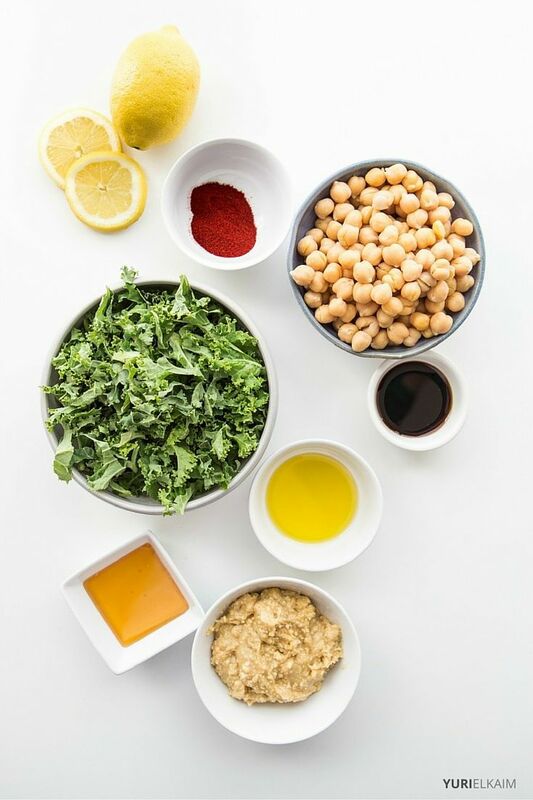 Chickpeas are also high in fiber, so along with the kale it’ll help in keeping you feeling full longer. If you’re short on time after a busy day, this kale vegan salad comes together in just 15 minutes. You can use regular kale instead of baby kale in this recipe – but keep in mind that kale leaves can be tough and bitter to the taste. You’ll want to massage the regular kale for a few minutes with a little olive oil and fresh lemon juice. Like I said earlier, you can substitute other kinds of beans for the chickpeas. Just make sure you dry off any store-bought organic beans before you fry (or roast) them. This recipe also works with butter beans, lima beans and Northern beans. Or, try another favorite and let me know how it goes. 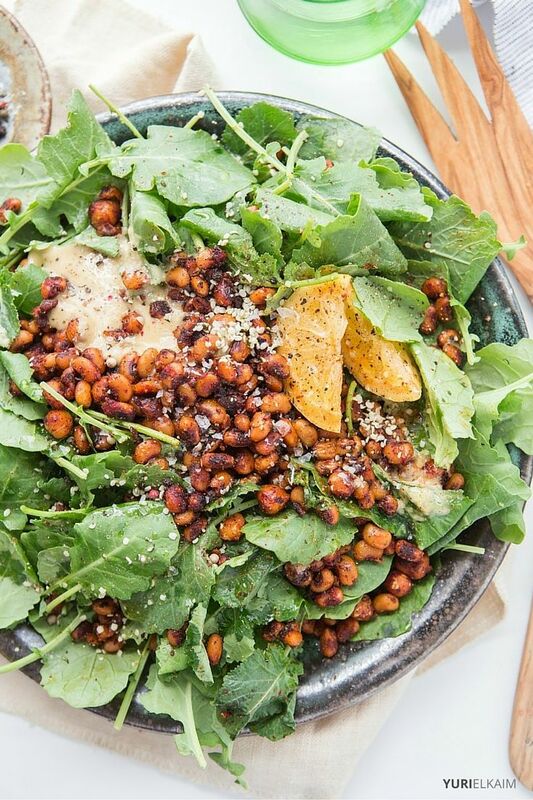 You can top this delicious, light-yet-filling salad with fried chickpeas, black-eyed peas, and/or lentils. Add garlic, cooking for about 1 minute, until aromatic. Toss chickpeas and paprika into the skillet and cook, stirring intermittently, until golden brown and crispy, about 5-7 minutes. Take skillet off the heat and add in the honey, tossing to coat. Place kale in a large serving bowl, toss with toasted chickpeas. In a high-speed blender, puree all dressing ingredients until smooth. Drizzle over salad. Want more delicious, allergen-free meals that take less than 15 minutes to make? You’ll want to check out the All-Day Energy Diet Community Cookbook, which features 67 tasty recipes that are sure to please. You can get it instantly – for FREE! – by clicking the banner below.